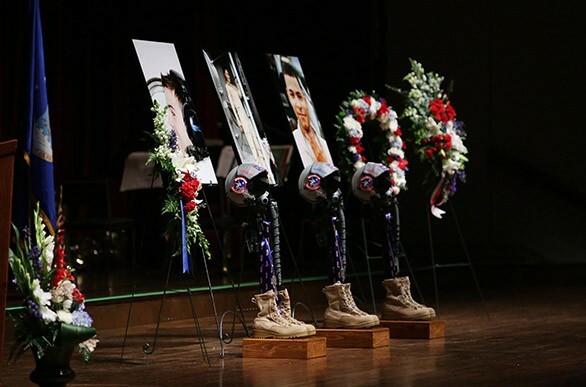 Memorials onstage to honor three fallen airmen. Bagpipes drone sharp and lonely over the solemn quiet of the INB Performing Arts Center in downtown Spokane. Hundreds stand straight, hands crossed behind them, some clutching damp tissues. Snare drums roll like falling rain as "Amazing Grace" sounds throughout the auditorium. One-by-one, dozens of airmen from Fairchild Air Force Base march forward to offer a final salute to their fallen comrades. They pause before three smiling photos of Capt. Mark Tyler Voss, Capt. Victoria Pinckney and Technical Sgt. Herman "Tre" Mackey III. Voss, Pinckney and Mackey, the crew of Shell 77, died May 3 when their KC-135 air refueling tanker crashed in Kyrgyzstan. Military servicemen and women, regional dignitaries and the Spokane community gathered this afternoon to honor their service. At the center of the stage, three sets of tan combat boots stand in a row. An aviation helmet rests atop each set to form a combat memorial. Airmen slowly file by in dark blue dress uniforms, pausing to salute. As the low hum of the bagpipes fades, a shout cuts across the room. Orders sound from just beyond the auditorium as rifles can be heard cocking, the heavy clack echoing against the walls. With the first volley of gunshots, a shudder ripples through the crowd. Babies wail and men sniff back tears. Two more volleys follow to complete the 21-gun salute. Col. Brian Newberry, commander of the 92nd Air Refueling Wing, speaks of their great sacrifice. They join the 2,090 other servicemen and women lost as part of Operation Enduring Freedom. He motions to the hundreds of people filling the center. "The crew of Shell 77 will never be forgotten," he says. Friends and family of the three deceased airmen take the stage to share stories of service, compassion, eccentricity and honor. Voss, of Austin, Texas, always looked out for those in his Air Force family. Pinckney, of Denver, Colo., served as a "hard-charging aviator" and loving mother. Mackey, of Bakersfield, Calif., became a father figure for those around him. Newberry says current and future airmen will hope to live up to their examples, and to be "guided by their starlight." Voss' mother Marcelle Voss says her son always dreamed of being a pilot. Fairchild gave him that chance. She singled out her son's gift for living life to the fullest. "Tyler was prepared to meet his maker," she says, urging the audience to cherish every moment and those people close to them. "May God bless America," she ends, "May God bless the military, especially the Air Force." Spokane Mayor David Condon then steps forward to read an official proclamation from the city, honoring the three airmen and voicing strong support for the Fairchild community. "We are humbled by your loved ones' sacrifice," he says. When the thunder of the gunshots dies down, a lone bugle starts playing "Taps." Those in uniform stand straight, saluting the row of memorials. Civilians hold their hands over their hearts as the lonesome tune carries over the auditorium. That, having You, they know no fear." Glass ends with a prayer. The bagpipes begin again as the crowd slowly files out of the auditorium. They quietly spill out onto the sidewalk where limousines and patrol cars line the street. Overhead, hoisted on the ladder of a fire engine, a massive American flag flutters in the wind.